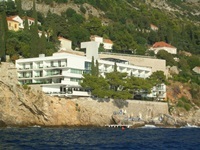 5-star Boutique Hotel More has one of the most beautiful locations among Dubrovnik hotels. 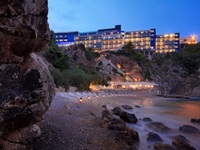 It is surrounded by an abundance of fragrant flora, century-old pine trees, turquoise waters and rocky cliffs. This hotel would be an ideal choice for guests seeking an intimate hotel, with modern facilities and impeccable services. Hotel More offers 36 luxuriously equipped rooms and 5 suites, each designed with natural tones to reflect a relaxing environment. 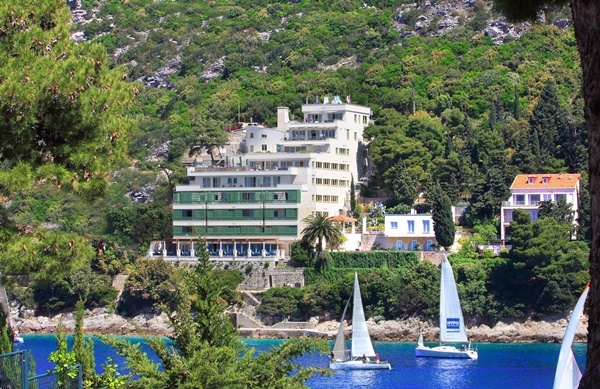 Guests can choose from rooms with sea view or garden view. Room amenities include air conditioning, direct dial phone, mobile phone in the room, free high speed internet access, flat screen LCD TV with free Pay TV, Sat TV and radio, room safe, trouser press, luxury bathrobes & slippers, bathroom with a whilrpool bath, a magnifying make-up mirro and a hair-dryer. 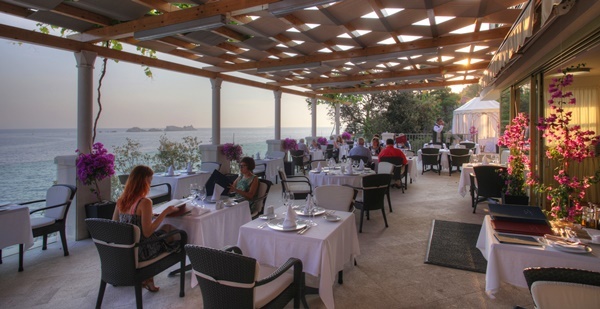 The ground floor of the hotel features an à la carte Restaurant More with a beautiful terrace. 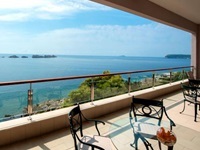 Guests may choose to dine indoors or on the terrace with breathtaking views of the charming Elaphite Islands. In the restaurant guests can enjoy a wide selection of local and international dishes. Cafe bar Taraca is located on the 7th floor and is a perfect place to enjoy a pre-dinner drink or simply spend time enjoying the refreshments. Cave Bar More is a unique bar located in the natural cave. It extends over three levels and can accommodate 60 persons. Guests can enjoy a wide choice of alcoholic and soft drinks, teas, coffees and snacks. The bathing place of Hotel More is situated right beneath the hotel. 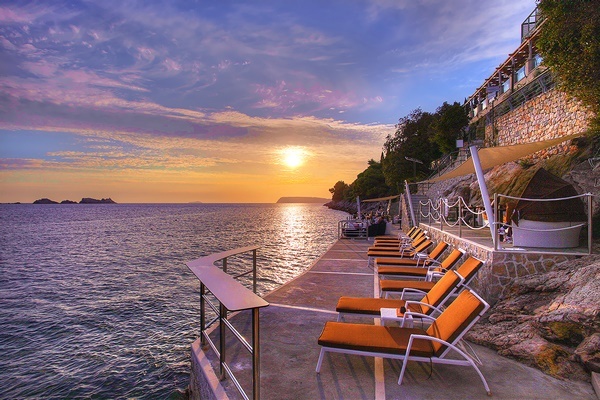 This is an ideal place where you can enjoy the sea and sun, with a beautiful view of the Elaphite Islands. 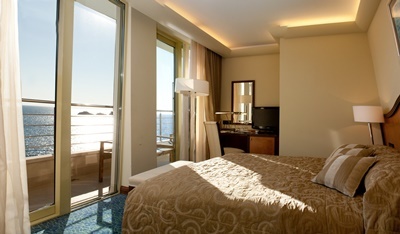 The fifth floor of the hotel features a terrace with Jacuzzi and swimming pool, an ideal place for relaxation. On the beach and at the swimming pool, guests may use deck chairs, parasols and towels at no extra charge. The third floor of the hotel features Wellness & Beauty More, while on the fourth floor there is a Fitness room. Wellness & Beauty More offers a wide range of massages (hot stone massage, bamboo massage and holistic massage). You can also choose from a variety of beauty treatments. Guests can choose from relaxing in the exclusive Katharsys thermal cabin or Hydro tub. Hotel's fitness room has state-of-the-art equipment, with a wall of mirrors and distinctive rocky wall and wooden seating. Hotel has a conference hall for up to 65 participants, which is ideal for every type of meeting and a smaller conference. Meeting room on the 7th floor with round table (up to 12 people) is great place for private smaller meetings or presentations. Hotel More offers luxurious transfer service, car and boat rental as well as personalized private tours. Close to the hotel you can catch city bus no. 5 to the Old Town (15 minutes bus ride). If you arrive to Dubrovnik by plane, the most comfortable way of reaching Hotel More is to prebook your private car transfer from the airport.